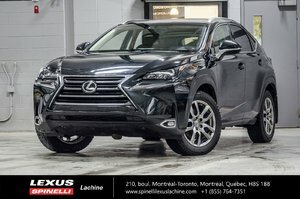 ACCIDENT FREE, LEXUS WARRANTY UNTIL APRIL 20TH 2022 OR 110,000 KM. AWD, MOONROOF, REAR BACKUP CAMERA, LEATHER INTERIOR, ELECTRIC / HEATED AND VENTILATED FRONT SEATS, DRIVER'S MEMORY SEAT, AUTOMATIC DUAL ZONE CLIMATE CONTROL, LEXUS PREMIUM AUDIO AM / FM / CD / USB / MP3 / BLUETOOTH / INTEGRATED SATELLITE RADIO W/ 8 SPEAKERS, LEATHER / HEATED / POWER TILT AND TELESCOPIC STEERING WHEEL W/ AUDIO CONTROL / BLUETOOTH AND CRUISE CONTROL, SMATKEY SYSTEM, PUSH START BUTTON, POWER TAILGATE, 18'' LEXUS ALLOY WHEELS, ROOF RAILS, LED FOG LIGHTS AND MORE!! Cylinders : Turbo 2.0L Engine @ 235 hp - Torque 258 pd ft - 4 cyl.